Interested in purchasing a puppy? Read below to find out how. Send questions/inquiries to Molly at [email protected]. Please tell me a bit about yourself and your family, what type of puppy you are looking for and feel free to ask any questions you may have. Most questions are either answered on our website, or can be answered by email. Thank you for understanding! 4) We are here to help with any questions/concerns you may have before, during as well as after you purchase your puppy! We love our babies and appreciate updates and pictures so we can watch them grow:) While we know there are no real "guarantees" that your puppy/dog will never fall ill (after all they are living, breathing creatures) our goal is to place happy, healthy puppies into loving family homes! Do not fill out the form unless you have been in contact with me and you are reserving a particular puppy!! I do not consider a puppy reserved until I receive both the application and fee. Thank you! Will your puppy be left alone for long periods of time on a regular basis? Do you have a safe place for your puppy to play and release energy? Have all family members agreed to getting a new puppy? Do you have children? If so, what are their ages? Do you have other pets? If other dogs, are they spayed/neutered? Have you read the Sales Contract? Will you be coming to pick up your puppy, flying in or would you like delivery? Click the "Pay Now" button to pay the application fee by PayPal. You do not need to have a PayPal account in order to pay by credit card. If you would like to pay by bank transfer, please contact me for info on how to do that. Sorry, we no longer accept personal checks. 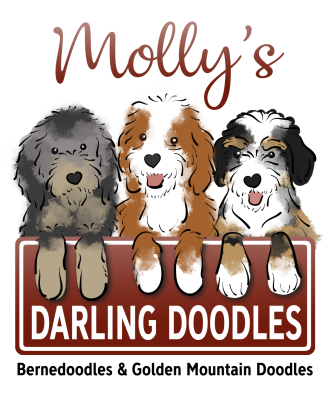 The balance of your puppy will be due in cash or cashier's check, written to Molly's Darling Doodles, at the time you receive your puppy. Thank You!